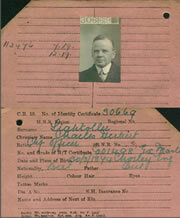 Second Officer Charles Herbert Lightoller was the most senior crewman to survive the sinking of Titanic. Lightoller first boarded Titanic in Belfast for her trials and then took his place as First Officer on the voyage to Southampton. The last minute inclusion of Henry Wilde, the Captain’s Chief Officer on his previous ship, Olympic, meant that Chief Officer William Murdoch was downgraded to First Officer and Lightoller was demoted to Second Officer for the maiden voyage to New York. Lightoller was off duty when the accident happened. He was lying in his bunk when he felt a slight jarring of the ship. He quickly got dressed and ran up to the deck, where he checked each side for signs of anything that Titanic had struck. Seeing nothing, he went back to his bunk and waited to be called if needed. Shortly afterwards Fourth Officer Joseph Boxall went to his cabin and informed him that Titanic had struck an iceberg and that the water was already up to the Mail Room on F deck. Lightoller later stated that on the night of 14 April a vital message from a ship called Masaba warning of field ice and icebergs directly in the path of Titanic had not been relayed by the wireless operators to the bridge. He was the officer of the last four-hour watch (18:00–22:00) prior to the collision and said that if the message had been delivered he would have slowed down the ship and requested permission from the captain to lay up a while.